Coming up Axel Merk joins me to break down the situation in the Eurozone, the likelihood of more nations following the UK in exiting the EU and how all this might affect the dollar, Fed policy and precious metals. 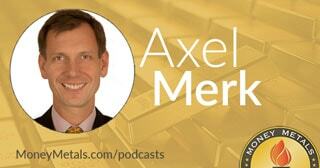 Don’t miss an enlightening interview with Axel Merk of Merk Investments, coming up after this week’s market update. A political crisis in Italy roiled markets earlier this week, sparking a flight to U.S. Treasuries and a spike in the Dollar Index. That spike was short lived, however. The dollar quickly came right back to where it started the week, a possible indication that an upside exhaustion point has been reached in this spring’s dollar rally. Precious metals markets are also seemingly on the verge of a major turning point. Nothing decisive happened this week, though, as gold continues to trade close to the $1,300 level and silver still finds itself stuck in a tight trading range. Silver prices currently check in at $16.48 per ounce, down 0.3% since last Friday’s close. Spot gold is down 0.4% for the week to trade at $1,296 an ounce. Meanwhile, platinum is unchanged at $911 and palladium is off by 0.7% this week at $988 per ounce as of this Friday morning recording. Precious metals prices have hung tough during the dollar rally of the past few weeks. The latest boost to the dollar came as anti-establishment political parties in Italy moved to begin breaking the country’s ties to the European Union. Without Italy, the entire EU could collapse. Italy is the euro zone's third biggest economy. More importantly for global financial markets, Italy has a massive sovereign debt obligation of about $2.5 trillion in U.S. dollar terms. The long-term future of the euro as a viable currency is in doubt, but it probably won’t go away anytime soon. The same could be said of the U.S. dollar if for different reasons. Investors who jump from one troubled fiat currency to another in hopes of landing on a safe haven are being short sighted. In the long run, all national currencies stand to lose value and some may even go into hyperinflation like the Venezuelan bolivar. Venezuela’s annual inflation rate is now approaching 14,000%. The socialist-run country has left its people suffering under constant shortages of bare essentials such as food and medicine. In a country now so economically destitute that many Venezuelans have been reduced to eating rats, insects, and other unconventional foods just to survive, those who do have any savings to speak of have also been forced to take unconventional steps to protect their wealth. As the Venezuelan bolivar becomes increasingly worthless, people are turning to the black market. They’re turning to U.S. dollars. They’re turning to cryptocurrencies. They’re turning to scrap gold, to silver coins, and even to aluminum cans. We may never find ourselves in the chaos of a true hyperinflation. But even modest inflation can exert a devastating impact on the value of savings and investments after a number of years. Physical precious metals are among the premier inflation-fighting assets. If hyperinflation ever does break out and parts of the economy revert to barter, then you may actually need to use your bullion as money. It’s been said that gold is the money of kings while silver is the money of the masses. During an economic crisis, copper may become the money of the expanding peasant class. For this reason and for another way to protect themselves against inflation, metals investors may wish to consider adding some physical copper to their stash. Copper fills an important gap, being suitable for smaller transactions where gold and even silver may not be practical options. Even if you never need to use copper in barter or trade, you may still be glad you have some exposure to the industrial metal for its upside potential. Copper prices haven’t done much in 2018, but they are still up big since Donald Trump’s election in 2016. President Trump’s pro-manufacturing, pro-infrastructure policies should put additional bullish pressure on the copper market. Copper is essential in the modern economy. Electronics, automobiles, and utilities among other things can’t function without it. Money Metals Exchange recently expanded its copper bullion product lineup. Now in addition to copper pennies and our “Don’t Tread on Me” copper rounds, we also offer 1-ounce copper bars and beautiful copper rounds in classic designs including St. Gaudens, Peace Dollar replicas, and the "Indian Head." Copper rounds are an appealing way for any metals investor to add to their stack. They are pure copper in a barter-ready size – clearly marked with weight and purity. A less aesthetically pleasing but more cost effective way to own copper is through circulated pre-1983 copper pennies. Don’t bother hoarding any of the newer pennies – they contain only a thin layer of copper and the metals they contain are worth well less than one cent. But a stash of old, solid 95% copper pennies could come in handy in the event you need metals to barter and trade. Money Metals has pre-1983 95% copper pennies sold by weight in 34 pound bags, and the copper in each of these pennies is worth about two cents at current market prices. We currently have them at less than two percent above melt value of the copper, making these older pennies a highly efficient way to get exposure to copper prices. Just like gold, silver, and other precious metals, you can order any of our copper coins, rounds, and bars securely at the MoneyMetals.com website -- or by calling 1-800-800-1865. Well, now without further delay, let’s get right to this week’s exclusive interview. Mike Gleason: It is my privilege now to welcome back Axel Merk, President and Chief Investment Officer of Merk Investments and author of the book Sustainable Wealth. Axel is a highly sought after guest at financial conferences and on news outlets throughout the world and it's great to have him back on with us. Axel, it's a pleasure to have you join us again today and thanks very much for coming on. Axel Merk: Great to be with you. What a week. Mike Gleason: Exactly. Well, Axel when we spoke to you in February the equity markets were in the midst of a sell off and some significant volatility, which had been extraordinarily low, came roaring back to life. Since then, the stocks have recovered some. The S&P regained about half of what it lost by the end of February and has been trading in a range since then. Our thoughts are that precious metals are trading inversely correlated to equities markets, at least for now. Unless we get a pullback in stocks or more appetite for safe-haven assets it will be hard for metals to get much going to the upside. But what are your thoughts on the relationship between gold prices and stock markets, Axel? And what factors do you expect to be driving stocks between now and say the end of the year? Axel Merk: Sure, and for context I think we should just mention we are talking before the Non-Farm Payroll Reports (are out), so who knows what's happened to markets since we have talked? One of the things I don't recall if I mentioned in February is, ever since last December, and I still believe in that, the markets have been a bit like a washing machine. That correlations have been breaking down. And, if you go back to, kind of, all the way to the financial crisis, that's the 2008 one, not the one from a week ago, that means that whenever there was a crisis the Fed bought treasuries. And so whenever “risk” falls off, when equities are plunging, bonds were rising. And that kind of ingrained this perception about certain types of correlations and so, similarly, the price of gold was actually reasonably highly correlated to that of treasuries. And so we got this thing that gold and the stocks are sometimes moving in tandem, sometimes they move in opposite directions. Since January 1970, if you look at monthly correlations, the correlations between stocks and bonds is 0.00. So, there is no correlation. Yet, we get caught up in this thing that, for months at a time, sometimes there’s a correlation that is significant. I think the most noteworthy thing of late is that yields have been, until a good week ago, have been matching higher and the price of gold was falling up. And then, conversely, when bond yields were falling, gold didn't rise. And so, gold has kind of marched on its own in some ways and I happen to believe that a lot of the buyers of gold these days are doing it because they are concerned about the equity markets because of volatility spiking. And the reason why volatility and the price of gold are related is because gold doesn't have cashflow. And that means the future cashflows don't get discounted more, whereas, if you have a quote unquote risk asset, like equities, and volatility increases, those future cashflows get discounted more and the prices of equities, all else equal, tends to fall. So, that's why in “normal” circumstances the price of gold should rise when equities tumble. Obviously, that doesn't always happen. Mike Gleason: You pay more attention than most people to events in Europe and the European markets. Lately, troubles in the PIGS nations have crept back into the news. Populace in Italy and Spain are making hay by opposing EU imposed austerity and it's a reminder that deep fundamental issues remain and the union may not survive. Let's start by getting your take, if we can, on the overall status of the EU. Will there be any high-profile exits, perhaps by Italy or Spain? Is Great Britain going to complete its exit? Or are you expecting the EU to weather the storm here, Axel? Axel Merk: The UK is almost certainly going to exit and nobody else, probably, any time soon. Now, I say that, I might have egg on my face in a few years down the road on that. But let me, maybe before we get too far carried away, make a general statement because I think we've seen this movie before. What we've had is a classic case, classic as in classic for financial crisis type of case, where investors were piling in into an asset that they perceive to be risk free, only to wake up that it is risky after all. And what I'm referring to, of course, is Italian bonds, right? Who wouldn't want to grab for some yield? And if you don't grab for some yield, especially if we’ve had someone like the head of the ECB doing quote unquote whatever it takes, all but guaranteeing the debt. So, why would you get a negative yield, or very low yield on German bonds when you can get Italian treasuries for a much juicier return? So, we've had yield chasers in there. Now, the noteworthy thing is, and, again, this is the same picture we've had throughout the financial crisis, the folks holding these are not risk-friendly investors. Those are folks who thought that stuff was risk-free. So, sure enough, there is some event happening and people is "Oh, my God! Italian bonds are risky! How could I have possibly known?" So, they run for the exit. Now, that doesn't mean there's nobody there to buy them. Whenever somebody sells something, somebody has to buy it. The folks buying are risk-friendly investors. And so, for example, on Wednesday, there was a treasury option and it was very well received and obviously they're not the same guys that sold the day before, but now you have risk-friendly investors come in. And you needed to have that kind of a shake-out and have other investors go in. Now, none of that means whether Italy is going to survive or not, but the relevant part here is that the system cracks when you build up this pressure cooker, when you have an unsustainable situation, and to me, it is unsustainable that folks, like Italians, pay a very, very small premium over – kind of a borrowing cost – than in Germany, for example. And when this pressure builds up, well, at some point, some steam has to be let gone and, depending on how much pressure has built up, the fallout can be greater. And so, for now, people woke up and now they can deal with this crisis as a risk event, whereas, before, it was something that was kind of a black swan event, and it blew up in some people's faces. Mike Gleason: Let's talk a little bit more about the implications for gold and silver markets. In recent weeks, the euro has weakened and that has been a big driver in the rally of the dollar indexes. This prompted some selling in gold and silver. On the one hand, we could see a continued euro weakness and dollar strength weighing on gold and silver prices; on the other hand, metals could get a bid if concerns over serious trouble in the EU drives some safe-haven demand. What is your best guess about which dynamic might win out there? Axel Merk: Curiously, during much of the Eurozone debt crisis, I'm referring to several years ago, the price of the euro and gold were quite highly correlated, but anybody liking gold wouldn't touch the euro with a broomstick. So, I'm just pointing out, as you pointed out, it's because if the dollar strengthens that, of course, this yellow metal doesn't change. And so, as the price of the dollar appreciates, the price of gold might go down. Now, that said, again, as volatility flares up, I do think gold is worthy of the consideration as a diversifier. Also, the reason why I went into detail here about the yield chasers, the market didn't trade as if the Eurozone were to break apart. By all means, bank stocks sold off, by all means, volatility surged, all kinds of things happened. But this was, here, momentum traders, yield chasers, being wrong-footed. And we had a violent unwinding of that. And that is one of the reasons why the price of gold didn't surge in this context, because this was not a trade that said "Oh, my God, the Eurozone is going to fall apart". Now, if that were to happen, then we going to see a very, very different picture. We also had, for example, bonds rally, right? But there was a very, very substantial short-position bond and so a lot of these guys took profits or said "Oh, I didn't expect it that a trade could go against me" and then when something is too good to be true, if too many people are piling the same trades, things go bad. Now, as far as the context of how this is going to evolve, we have no idea even by the time your broadcast is, what's going to happen next. Are they going to form a new government, are they going to have called new elections, who knows? Anything is going to happen. We have a populace resentment for all the right reasons and the European Union is incapable of communicating with the people and saying "Hey, we're the good guys. We actually mean well for you." People are fed up. Now at the other end of the spectrum, though, if you have a populist rising, usually the more extreme opinions prevail. And so they are not ruling out that some bad things can happen. When I buy something in Europe, I buy the German stuff, the Northern European stuff. And ultimately, if it were to break apart while I still have that Northern European stuff, right? And that doesn't mean buying Italian securities is necessarily a bad thing, but you better be aware of the risks that come with it and tying it back to the price of gold, the question is "Is there contagion? Is the Federal Reserve going to change course?" and so forth. In the short term, I don't think the Fed it rattled by this. Access to credit continues to be easy. I think the Fed is going to continue to march higher. Now, all that said, I do also think inflationary pressures in the euro's going to move higher because I don't think the U.S. economy is about to implode. And so, because of that, I do think people are going to continue to look at gold as a diversifier and at some point that cycle's going to turn. I don't know whether it's in six months or in a year or down the road. We're looking at these indicators, I don't think we're at the top of the cycle at this stage. I think it's going to continue for another six months, maybe twelve months, and maybe even eighteen months. I can only give us like a six to ten months outlook on this. But, for the time being, inflationary pressures are rising and the Fed is going to slowly but surely march higher. He's apparently quite upset at the unraveling of the Iran nuclear deal, anti-EU populism, and new calls for fiscal austerity. At the same time, he launched a campaign this week to try to reverse the Brexit decision. Is this just sour grapes by Soros or do you think the world financial markets are truly on the precipice? Axel Merk: To understand Soros, I think the only thing one has to understand that he is Hungarian at heart. He grew up in Hungary and he loves Hungary. He would love everybody in the world, especially the European Union, to write blank checks to the Hungarians so that that country's standard of living moves higher. And so they want the Germans to write checks, they want the French to write checks, they want everybody to write checks so that the Europeans are happy. It has nothing to do with the Eurozone being sustainable or not. I have no idea why people are listening to Mr. Soros. Sure, he had a great trade on the Bank of England, but for him, it is all about trying to support Eastern Europe. That's very well intended. Godspeed for him, let him help these folks and he has some initiatives and foundations that does it. Great for him. But, to conclude from any word he says, whether the Eurozone is stable or not, I wouldn't listen for two seconds to his opinion. Now, that doesn't mean there aren't any issues in the Eurozone, by all means. But, a lot of people are biased when they hold a trading position, well, George Soros's trading position is that he wants Eastern Europe to thrive. And if the West can write a check to do that, then he likes that. Anything, any tough austerity measures, anything that against that, Mr. Soros says "Don't do it". And so, it's very different answer, probably than you might have expected, or you get from other folks, but, if you look at George Soros as a person who has an agenda to help Eastern Europe, then you understand everything and anything that he says. Mike Gleason: Getting back to the Fed here, briefly. They have been tightening, which is contributing to some of the dollar's strength, but they almost certainly don't want a collapse in the euro, and there is, we think, a limit to how much of a rally they're going to put up with in the dollar. What are your thoughts there? Expand on that a bit. It seems like the markets have priced in a couple more rate hikes this year. Sounds like you think we'll probably get those? Axel Merk: Well, let’s think about it. We got a new Fed chair, right? Jay Powell. And he's a lawyer. He does not have a magic framework. Bernanke had this Great Depression framework, Yellen was a labor economist, well Powell is a lawyer. And he's a smart lawyer. And he has good intentions. So, what do lawyers do? Well, they call a committee to decide on things. So, one thing you can be sure of with Powell, in my view, is that he's not going to be very fast. He's going to call the best and the brightest, to give him their opinion, and then he's going to make a judgment based on that. And that might be a very boring answer, but, that's what it is. And the one thing that a Powell Fed will look at is A, is the economy going to continue to move ahead, is the “slack” exhausted, and are financial conditions all right? One of the things Yellen always said is that "Hey, our quantitative tightening is like watching paint dry on a wall and it's really nothing." Well, that's a bunch of BS because the whole point of raising rates is to tighten financial conditions. But, at the same time, it hasn't happened. The financial conditions have been easing. In early 2016, the Fed panicked because the fracking market didn't do well. This time around, stock marks has had a hiccup or so, but access to credit hasn't been any tighter. So, as long as access to credit is not tightening, the Fed is going to continue to march. And what we have is, the typical thing at this time of the cycle is that banks are actually easing lending standards. Because the economy is doing all right, they want to write more credit. And that's why the Fed is going to continue to tighten. Now, as that happens, of course, at some point they'll overdo it and push the economy into a recession and maybe they're geniuses and do a soft landing, but that's usually more luck than anything else. And so, at the same time, they're not in a rush. Last year was the first year in many, many years where the Fed tightened more than was priced in the beginning of the year. This year, I would think the same thing can happen again and what has happened over the last week to ten days is that rate hikes expectations has come down quite significantly, obviously, partially because of what happened in Italy. Now, that said, 85% of the U.S. economy is domestic, 15% is international. And so, unless Europe blows up the next day, I don't think the Fed, in the near term, can change course. Also, keep in mind, by the way, just a word back on Italy. Italy has had about one government a year. And so even if they have a new election, even if they elect a more populist government, odds are that their new government is not going to survive very long. There's a European parliament election next year and the two populist parties, if the two are going to buddy up, and that's still an if, they might get into an argument because, ideologically, they're not exactly aligned. And so, a lot of things can happen, and the Fed is not going to pay attention to that because they going to say "Hey, if something does blow up in our face, we can still reverse course". And so, it’s very different from the Yellen Fed in early 2016, when it was spooked about equity markets going down. And the reason they were spooked about it is because access to credit in the fracking industry was at risk of spilling over to the rest of the economy. At this stage, we see no signs that access to credit is tighter, so they'll continue to march ahead. Now, what does it mean for metals? It doesn't necessarily mean it's bad, because the pace at which they're moving is very slow and, by the way, we are already at extremely low unemployment. The labor participation rate is slowly inching higher. I happen to think that in about six months we'll have exhausted that so-called slack, which means inflationary pressures are going to accelerate. And that's exactly when the Fed is going to be at a point where it's going to slow down the economy. And so, we going to have this inflationary push at the end of this economic cycle where the Fed is, in my view, not going to be fast enough to do something about it. And then, because of the higher rates causing more volatility in the markets, in my view, all of that are reasons why precious metals historically, do reasonably well at the end of an economic cycle, which we're going to see presumably a year from now, or whenever it's going to be. Mike Gleason: Yeah. Very well put. There's a lot of things circling about, and I think you summarized that all very well. As we begin to close here, any other news stories that you're going to be watching closely as we progress throughout the year, Axel? Axel Merk: Well, we’ve got a European Central Bank meeting in June 14th. So, in the short term, that's probably the most interesting event. Whether anything is going to happen, the one thing that Mr. Draghi is not going to do is he's not going to take options off the table, which means he's not going to announce the end of QE. There might have been an early chance for him to do it, but, with what's happening in Italy, he's not going to do it. The one thing to keep an eye on there is, what I think may happen in the Eurozone is that they have indicated they'll stop QE before they'll start tightening. I wouldn't be surprised if they'll get more flexible in that. Meaning that they'll start hiking rates. At the same time, at some point, if the crisis were to escalate, Mr. “Whatever-It-Takes” Draghi is going to say "Hey, but, we're not going to allow Italian bonds to trade at too much of a premium" and so to interfere in the markets that way. But they have to, in my view at least, get off that negative interest rates because it's creating havoc in the rest of the Eurozone that's actually doing quite well. So, he might, again, pull up some ace up his sleeve where he's going to say "Yep, rates are going to move higher, but only for Germany and the Northern European countries, whereas, for Italy and others, we'll guarantee that rates are not going to move higher". And before you dream too far ahead, just keep in mind, Draghi's job is coming to an end at the end of next year, so, as we go towards the end of this year, people are going to speculate who's going to succeed him. But that's a story for another day. Mike Gleason: Yeah, we seem to be focusing a lot of our interest on Europe, once again here. It seems like we've been down this road before. Well, good stuff as always, Axel. It's great to get your perspective on these matters and we look forward to catching up with you again later this year. Now, before we let you go, please tell listeners a little bit more your firm and your services and then also how they can follow you more. Axel Merk: Sure. The firm is, my name, Merk Investments. Look us up. Sign up for our newsletter on our website. Follow me on Twitter, that's really the best way to be in tune of what is happening there. We have several funds, including a gold fund. And we provide some services to institutions and other folks. But come to MerkInvestments.com and browse around. Mike Gleason: Excellent stuff. Thanks again, Axel. Appreciate your time and hope you enjoy your summer and thanks for joining us again. Take care. Axel Merk: Yep. My pleasure. Take care. Mike Gleason: Well, that'll do it for this week. Thanks, again, to Axel Merk, President and Chief Investment Officer of Merk Investments, Manager of the Merk Funds. For more information, be sure to check out MerkInvestments.com and follow him on Twitter. His handle is @AxelMerk. Check back here next Friday for our next weekly Weekly Market Wrap Podcast. Until then, this has been Mike Gleason with Money Metals Exchange, thanks for listening and have a great weekend everybody.